When you run jig init on a Git repository it does two basic things. First it creates a $GIT_REPO/.git/hooks/pre-commit file and makes it executable. This is really just a redirection of control to the Runner object. It does all the work. Secondly, it creates a $GIT_REPO/.jig directory with a plugins directory and an empty plugins.cfg configuration file within it. As you install plugins the configuration file will get modified to includes bits of information about whatever plugin you install. When you install plugins from a URL, the plugin will be cloned for you automatically and then placed in the .jig/plugins directory. If we installed the following plugin by running jig plugin install http://github.com/myusername/myplugin it would be saved in a directory similar to this. .jig/plugins/24a8056749e448b182d44690a04ca0b7/myplugin. The configuration file plugins.cfg will now contain a reference to this location. It also contains the default settings for this plugin as defined by the author. You can change these settings to affect the way the plugin behaves. Git automatically runs Jig when git commit is ran. It happens before your staged files become an object in the Git database (before your commit is written). The neat part of this is that if Jig returns an exit code of 0 the commit will occur. 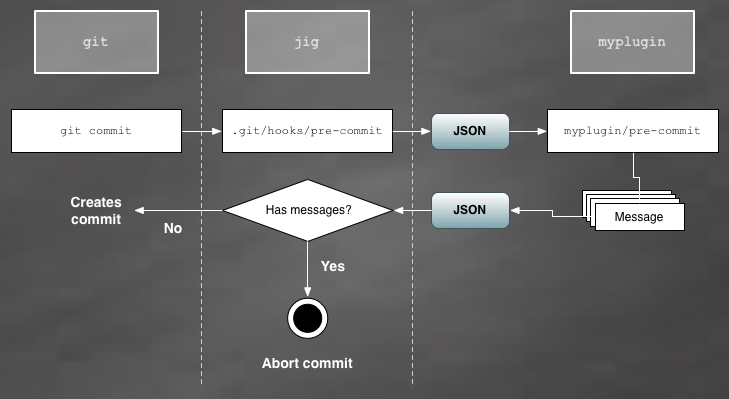 But if Jig returns a non-zero exit code like 1, Git will abort the commit. Jig communicates with plugins using the JSON data format. Both the input and the output are JSON. This is convenient because almost all scripting languages that will likey be used to write Jig plugins can easily deal with JSON data. A plugin has the ability to pass messages back to Jig that will be formatted and displayed in the terminal. Running the tests, building the documentation, and cutting releases to PyPi are all done through the Jig development environment. Install Vagrant and either VirtualBox or VWmare Fusion/Workstation. If you decide to use VMware (it’s not free) you’ll need the Vagrant VMware plugin that allows Vagrant to support VMware. You should see some instructions on where to proceed as part of the Linux message-of-the-day.